This Wide Field Image of Tycho's Supernova Remnant is a color composite of Mid-Infrared by Spitzer Space Telescope (red), and X-ray (blue: high-energy X-ray, green: middle energy, yellow: low-energy) by Chandra X-Ray Observatory on Near-Infrared by Calar Alto 3.5m Telescope. The remnant is approximately 25 ly in diameter. On Nov. 11,1572, astronomer Tycho Brahe observed a bright "new star" ? now knownas a supernova ? in the constellation Cassiopeia. Brahe observedthe star, which outshone even Venus in the night sky until it faded fromsight in March 1574. Now, morethan 400 years later, astronomers have use the Subaru Telescope in Hawaii toobserve "light echoes" from the stellar blast to determine its originand type and relate that information to what they see in the supernova remnanttoday. A supernovaoccurs when a star dies violently, sending out an extremely bright outburstof energy. Some of thelight from the original supernova event bounces off dust particles insurrounding interstellar clouds and reaches Earth many years after the directlight passes by; in this case, 436 years ago. These reflections are called"light echoes." InSeptember, scientists used the Faint Object Camera and Spectrograph (FOCAS)instrument at Subaru, to break apart the light echoes of Supernova 1572 intothe signatures of atoms (spectra) present when the star exploded, bearing allthe information about the nature of the original blast. "Usinglight echoes in supernova remnants is time-traveling in a way, in that itallows us to go back hundreds of years to observe the first light from asupernova event," said Tomonori Usuda, lead project astronomer at Subaru. "We got to relive a significant historical moment and see it as famedastronomer Tycho Brahe did hundreds of years ago. More importantly, we get tosee how a supernova in our own galaxy behaves from its origin." This sameteam used similar methods to uncover the origin of supernova remnant CassiopeiaA in 2007. The resultsof the Subaru study, detailed in the Dec. 3 issue of the journal Nature,showed clear absorption of once-ionized silicon and absence of the hydrogenH-alpha emission in the light echoes ? signatures typical of a Type Ia supernova observed atmaximum brightness of its outburst. Type Ia supernovae are generally thought to originate fromwhite dwarf stars in a close binary system. As the gas of the companion staraccumulates onto the white dwarf, the white dwarf is progressively compressed,and eventually sets off a runaway nuclear reaction inside that eventually leadsto a cataclysmic supernova outburst. 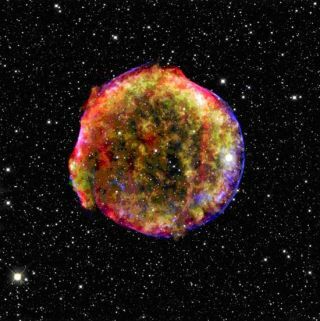 The Subarustudy found that Tycho's supernova belongs to the majority class of Normal TypeIa, and, as such, is now the first confirmed and precisely classified supernovain our galaxy.